Shipping temperature-sensitive products typically requires including refrigerants with your product packaging. Our standard gel ice packs are the most cost-effective solutions for maintaining a refrigerated environment. Available in seven (7) stock sizes, these durable refrigerants are also available in custom prints and sizes. Moisture-resistant gel ice packs are an effective solution when condensation is a concern. These packs minimize moisture inside the package. Available in six (6) stock sizes, these refrigerants are also tear and puncture resistant. For additional protection against leaks, we offer a leak-resistant gel ice pack formulation. This gel formulation is biodegradable and available in either our standard poly or our moisture-resistant pouch. Block ice packs are an excellent solution when consistent shape is required. These ice packs are constructed using a foam block, which helps ensure a consistent shape after freezing. For shipping in freezing weather conditions, our heat packs (or even ambient gel packs) may be the solution for protecting shipments in cold stress environments. 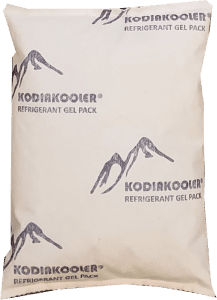 All KODIAKOOLER® gel packs contain earth-friendly, non-toxic ingredients. Although not for human consumption, the ingredients can be diluted with copious amounts of water if accidentally swallowed. Gel pack inside contents can be flushed safely down a sewer and the plastic liner can be recycled or discarded at an approved sanitary landfill. We also stock a wide variety of other packaging products including boxes, mailers, cushioning materials, temp monitor labels, tapes, stretch wrap, paper products, labels, and much more.